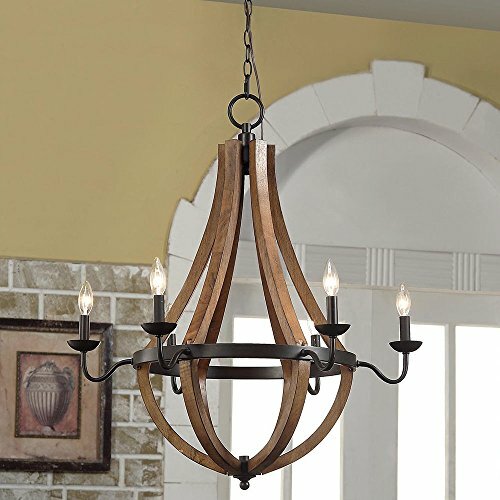 Add style and sophistication to your entryway or dining room with this rustic chandelier. Featuring a modern farmhouse design, this hanging lamp accommodates six 60-watt bulbs (not included) that provide multi-directional lighting where you need it most. This light fixture is UL listed for added safety, and it comes with 74-inches of chain, giving you the opportunity to adjust it to fit your space. WINE BARREL RUSTIC CHANDELIER: Inspired by wooden slats, this circular 19" wide light captures timeless elegance. HIGH CEILINGS: With 74 inches of adjustable chain, this ceiling lamp is great for tall rooms and two story houses. OIL RUBBED BRONZE FINISH: Modern farmhouse piece easily matches your home decor. MULTIDIRECTIONAL LIGHTING: Candle-style design provides warm and ample illumination. If you have any questions about this product by MFR Light Fixtures, contact us by completing and submitting the form below. If you are looking for a specif part number, please include it with your message.